. Interact with the applet below for a minute by dragging the white point along the arcsine curve. The graph of the derivative of this function will be traced out in gray. If you'd like, you can take a guess as to what the derivative function might be. (Just don't look it up on another tab.) Hit the "Clear & Retry" button to take another guess (if you'd like.) Complete the activity questions that appear below the applet. , notice how y is written in terms of x. Rewrite this equation so that x is written in terms of y. For the equation you wrote in (1) above, use implicit differentiation to differentiate both sides of your equation with respect to x. Sketch a right triangle that has an acute angle with a measure of "y". Label the 3 sides of this right triangle (in terms of x) so that the equation you wrote for (1) is true. solely in terms of x. 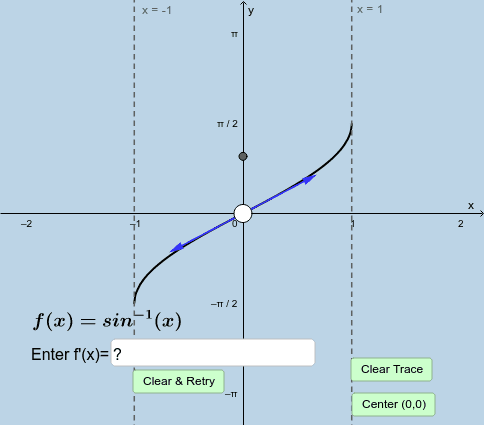 After doing so, enter THIS FUNCTION into the applet above to see how its graph compares with the gray trace. Is it correct?